This was a very graphic novel heavy month. I blame whoever told me about ‘Revival’ – a fellow blogger, I believe. But how could I resist the undead in Wisconsin??? Exactly, you’re going to get a copy right now, I can tell. Well, at least skim this post before you go! There were a few other good picks this month! Free Comic Book Day first issue of a new series. I didn’t realize half of the dialogue would be in Spanish, but I was feeling pretty good about my Duolingo obsession as I managed to translate it for myself and get the gist of each conversation. I might pick this up when it is a trade to see how it plays out. This really only gives you the most basic setup for the story and then it ends with an epic WTF cliffhanger. I tweeted the other day that I was reading a story about zombies terrorizing a rural town in Wisconsin but that is SUCH an oversimplification of what this series is. Yes, the recently dead have returned to life but they are not mindless zombies and, in fact, if undiscovered, can pass as normal humans. This is only the first trade, the first 4 comics, and you can see all the threads of different plots being laid out for you, even though it is unclear where they will all lead and when they will all meet up. Second book left me with even more “WHAT IS HAPPENINGS” feelings. WHOA! This was the big one, the book where things are starting to fall into place. I don’t know where that place is, but I feel like things are kind of sort of becoming clearer? Can’t wait for book 4! I can’t decide if this was too preachy or not. I would like someone from the target demographic to read it and tell me if it was too eye-roll in the way the teens talked. It kinda felt like an after school special. Still, this would be a great addition to a high school library for students to “find” on the shelf on their own if they are trying to understand the discussion around defining consent. I didn’t realize this was a character from a previous Star Wars comic, but I thought the first trade did a great job of introducing her but leaving enough mystery that I kind of want to go back and read the stories she appeared in before. Anti-hero, snarky, badass – yeah, she is pretty hard to resist! It’s the Star Wars Halloween book I never knew I wanted until now! This title record needs a little more details – like the fact that this is just part 1 of a series. Melanie Gillman’s comics can be read online and the book ends suddenly because the story is not yet over, so it feel hard for me to really rate this because we have just met these characters. But I would say this is off to a good start, a series to watch and I hope she gets enough funding to print the rest of it so more people have access to it. Currently Reading: Authority by Jeff VanDermeer, the second book in the Southern Reach trilogy, “sequel” to Annihilation. This book makes Annihilation look straight forward! I’m almost finished too, no idea where it is all going and I know I’m going to need book 3 immediately. Look at me, reading books written for adults! Don’t worry, it won’t last too long. 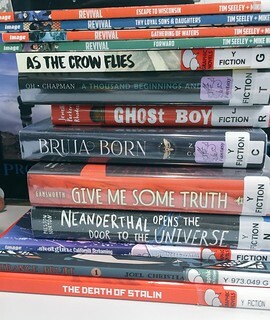 As soon in this photo posted earlier this week, after I get through the rest of ‘Revival’ there are a lot of new YA novels begging me to pick them up. Previous Castle Rock – I give up!